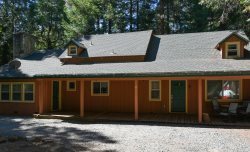 This Large 4 bedroom 2.5 bathroom Cabin is a fantastic mountain home in a very nice neighborhood. Your family will feel right at home. GREAT location, just a block away from town. A renovated large and lovely home in Sierra Village, less than a mile to Highway 108. New double pane windows throughout, new stucco exterior, new heating and cooling system. This home is located in a snowy area so 4-wheel drive or chains will be required in the winter. Tons of fun in the summer and in the winter. Just miles from Pinecrest Lake, Beardsley Lake, Lyons Dam (great walking trails) Dodge Ridge Ski Resort, Leland SnoPark. AND.....a short twenty minute drive to Black Oak Casino, for concerts, bowling, great food and gaming. Enter into the living area where you'll find lots of space to hang out and an entry onto the quiet back deck. There is a nicely equipped kitchen, formal dining table with seating for 6, there is more available eating space in a breakfast nook for 5-6 and spots for four more at the kitchen island. New stove, refrigerator and dishwasher. In the living room there is a gas fireplace, a Fujita heat and cooling system, a large and cozy couch and a second couch that sleeps two. Large screen TV, cable and Wi-Fi. Down the hallway from the kitchen you'll find a bedroom with 1 double and a single bed and a separate half bathroom. Lots of great storage space and a washer and dryer. Off of the living room, the 2nd bedroom with a queen bed and 2 singles and a full bathroom, tub and shower. Upstairs, you will find the master bedroom with a King bed and bathroom with separate tub and two showers and a second Fujita heating/cooling system. Downstairs there is the rumpus room with a pool table, a single and a queen bed and TV with cable, a very efficient Pellet Stove and there is another bedroom with a king bedroom. The exterior of the house boasts a large backyard with incredible views and there is parking for 3-5 cars (2 in the garage). We must have 24 hour notice prior to your arrival. Linens are not included in rental. This home has a "no pet" policy. We must have 24 hour notice prior to your arrival. After hours number is 209-586 5204.